The raven is a Celtic omen of death. This was used to good effect throughout the hidden-alley sojourn. The title “Face the Raven” was, in and of itself, a spoiler. No real surprise that a Shade came to visit. Popular European folklore tells us that the raven carries souls to the Otherworld. A raven sighting can send shivers down the spine. In Edgar Allen Poe’s classic work, “The Raven,” the bird represents death and finality. It has been said that the work, as a whole, may represent man’s inability to escape fate. The raven, or Quantum Shade, in this episode embodies the dark imagery that has often been attributed to the bird in European culture. The title was a dead give-away for this writer, indicating that there would be death and ill will. Rigsy (played by Jovian Wade) from Series 8’s “Flatline” seeded a dark mystery when he wakes to find a number tattoo on the back of his neck. The puzzling tattoo is not static. The number changes minute by minute, counting down. We can make the easy assumption that reaching zero will represent death. After the credits, this assumption is confirmed by the Doctor once he, Clara, and Rigsy convene in the TARDIS, where the Doctor scans Rigsy head to toe. Rigsy is told that he has had significant contact with alien life form and that he has been retconned, his memory wiped clean of the encounter. When the Doctor realizes that Rigsy is dying, he flips through the cards Clara prepared for him (seen earlier this series during “Under the Lake“) in an attempt to find the appropriate words. There are none, of course. And the journey to save Rigsy’s life begins. Not knowing where to actually start, the Doctor takes Clara and Rigsy to London to find a trap street, used by cartographers to catch potential copyright violators. The Doctor felt certain aliens may be living there. Looking for this street provides the impetus for Clara to dangle wildly from the TARDIS door while the Doctor is flying high above the city. She’s wearing the sonic glasses to help find a hidden street so that the Doctor can create a map. In my estimation, this scene was over the top, but an apparent way to foreshadow Clara’s impulsive and poor choices. On the streets of London, the trio begins their search for what will be Doctor Who‘s version of Diagon Alley. After a trip back to the TARDIS, Clara picks up Rigsy’s phone, which had been plugged in to attempt to retrieve data. The phone had a broken screen and wasn’t working, but Rigsy could not remember how the phone had gotten damaged. Once placed in his hand again, with data restored, the memory flooded back of a woman lying on the cobblestones, bleeding from the head. This becomes the key that allows Rigsy to be able to see the opening to the street in a gap between two buildings. I am intrigued by this trap street. Hidden alleys and passageways have always been a draw for me. And I eagerly anticipated what they would find once they step into the gap. Having been able to avoid spoilers, I was surprised to find Lady Me at the core of this mystery. While Maisie Williams’ character as Ashildr provided the actress a good entrance to the Who world, each successive appearance has been progressively more disappointing. I don’t blame this on Maisie, but on the writing for her characters. “Face the Raven” was written by Sara Dollard, an Australian screenwriter who lives/works in the U.K. The J.K Rowlingesque aspects of Dollard’s writing for “Face the Raven,” are intriguing, but from this writer’s perspective, there may not have been enough time taken to review the previous episodes as research for character development. In addition to the arrival of Lady Me, who is mayor of the community on the trap street, we encounter others who accuse Rigsy of murdering the woman we saw lying on the cobblestones. The street is a place of refuge for aliens in need. We, the viewers, see all the people there in human form, as does the trio apparently. Lady Me/Mayor Me explains that each person sees through their own perception due to the Lurkworms. Their light is a telepathic field and when compromised the aliens are visible as they are – e.g. Ood and Cybermen existing together. Perhaps, from this perspective, there is a camaraderie that is not achievable in the outside world. Yet, there is one staunch rule that stands out as, perhaps, barbaric – the use of the Quantum Shade for “peace-keeping.” The death sentence meted out can be lifted by Mayor Me, but only if the residents of the street agree that the individual should be pardoned. All the trio needs to accomplish is to find the real killer and then convince the street to pardon Rigsy. Mayor Me leads the trio inside where they find the presumably dead woman (Anah) in a laser container. Mayor Me tells them that she is being held until a proper burial can occur. From here the Doctor and party go back out in the street where they witness the death of a man via Quantum Shade. We have seen the raven in a cage, waiting for its next release, when it will retrieve a soul. The presence of the bird is a constant reminder on the street to do well, to refrain from what is deemed criminal. Clara is told that the mark of death, or chronolock, can be given to another, one time, if the other is willing to accept the sentence, and her impulsive wheels begin turning. Though she has missed a very important point – you can’t cheat the chronolock. Of course Clara does attempt to cheat it. She believes that Lady Me will remove the sentence from her since she told the Doctor she would keep Clara safe. Clara convinces Rigsy to allow her to have the chronolock and the tattoo transfers to the back of Clara’s neck, countdown continuing. While she’s talking to Rigsy, Clara throws out another reference to Jane Austin, which feels gratuitous. It’s fleeting. And I wonder if it truly accomplishes a purpose other than to cause gossip? Last Series, the genuine relationship between Madam Vastra and Jenny made wonderful sense. The bits of implications in Series 9 from Clara seem a lark rather than a nod toward accepted bi-sexuality. At this point, with approximately 15 minutes left, the meat of the show begins. All else has been a lead in to these moments and here, in my opinion, is where the episode falters to greatest extent. The Doctor runs back to Anah; the TARDIS key is used to unlock the cage and free the woman who is mother to the young girl. Anah is alive. Mayor Me had set it up to create the illusion of her death, all to lure the Doctor there because of a deal that she made with the Shade. In addition to a soul, the deal includes teleporting the Doctor to an unspecified place. Mayor Me asks for his confessional dial, though she clearly does not know why it is wanted. He hands it over to her. Mayor Me, based on the terms of the contract she entered into, can now remove the cronolock from Rigsy’s neck but it is revealed to all that Clara has it. How, I wonder, did the Doctor not notice this earlier. Rigsy has short hair; the Doctor been checking the countdown frequently; but he didn’t notice that the back of Rigsy’s neck was now clear of the tattoo? Clara’s impulsivity has been her undoing. Mayor Me cannot change the terms of the contract, apparently (which makes little sense to me) and the chronolock must stay – Clara cannot cheat the death sentence. This entire premise is full of holes from where I stand, but it is what it is and the rest of the show continues from there with the Doctor and Clara’s final farewells. Doctor Who is known for its feels, but the exchange between the Doctor and Clara is far more sterile than previous separations between Doctor and companion. Based on the development of the 12th Doctor’s character, we could make the case that he is more detached from his emotions in this regeneration, but this is a man who has grown to hug others, when at first he was averse. There has been emotional character growth, which is not evident in the parting of the Doctor and Clara. In fact, the entire death scene has a feeling of sterility. Clara walks calmly (bravely according to her whispers) into the street to await the Quantum Shade. This does not mean that I didn’t tear up a little, but I was certainly not driven to the tears that appeared during Doomsday. And so she falls onto the cobblestones of a trap street in London. Good-bye Impossible Girl. Good-bye Clara and Oswin. 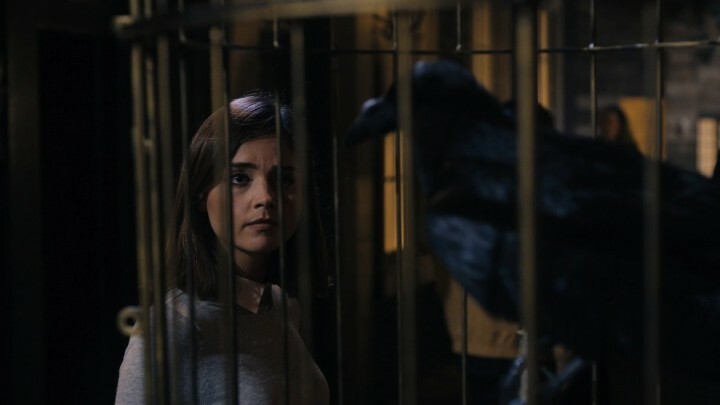 “Face the Raven,” is the first part of a two-parter, which always means that some aspects that appear at loose ends may be cleared up in “Heaven Sent.” Only time will tell, which we know is wibbly-wobbly, so it’s a crap shoot. I, personally, enjoyed the mysterious trap street, the allusions to mythology, Poe, and all things dark and lovely. There are those who did not appreciate this particular bent, which is more nebulous than the science of Doctor Who. And, yet, one could argue that there was enough science in the way Anah was kept in the laser container and in the way Mayor Me set up the use of the TARDIS key and the teleport bracelet. In the end, I suppose my biggest complaint is that I wanted more – more than could be delivered in the allotted time frame. I would have liked more insight into the history of the street, into Mayor Me’s character, into the reason the aliens were present, and definitely more between the Doctor and Clara. Whatever you may feel about Clara Oswald, this woman has been in the Doctor’s time stream; she is more closely associated with the Doctor’s regenerations than any other companion has been. And this is the way it ends between the two of them? With a whimper and not a bang? We are near the end of Series 9 now; bring on “Heaven Sent.” Where does the Doctor go from here?